For some one who would marry her. And keep her stockings mended. Because a hole was in her stocking. He did not twig her stocking. Oh, such a fuss, &c.
Because it was so matted. The barber at it cried, oh fie ! He saw the hole in her stocking. And then he spied her stocking. As sole and upper leather. His eye fixed on her stocking. Oh, what a fuss, &c.
Sit down and mend the old ones. And of all the towns in Ireland, Kilkenny for me. Like a dish of fresh strawberries smothered in cream. But her heart is more hard than its marble I'm sure. For there I got sweethearts, but here can get none. I am an Irish exile, and from Kilkenny I came. The hole in her stocking - first line reads: In London once as I've heard say. 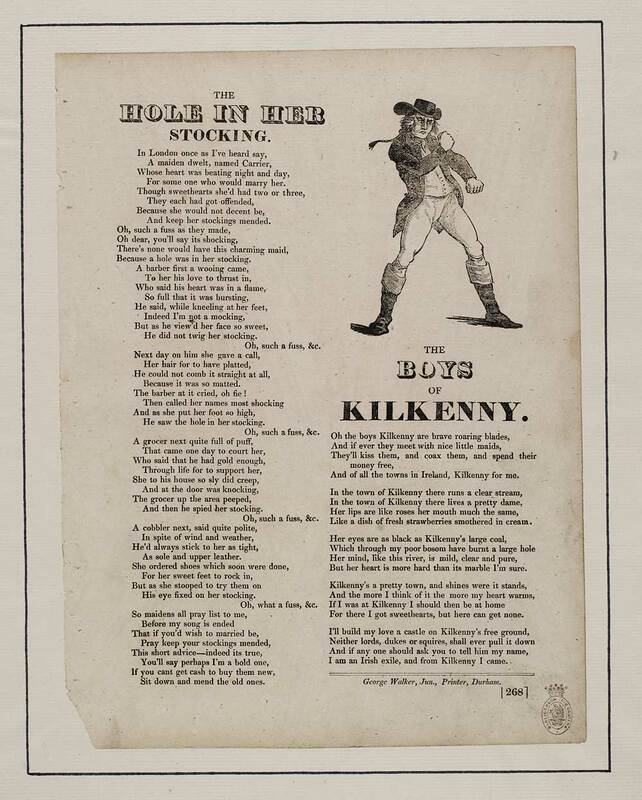 The boys of Kilkenny - first line reads: The boys of Kilkenny are brave roaring blades.